Two hea vy-duty treadle pumps have now been successfully installed and are providing regular irrigation for crops for two villages. Villagers take turns to man the pumps and provide the water for vegetables to eat or sell. TASC Madagascar will monitor the success of this project and consider expanding it to other villages. We are delighted to announce that Taunton School has selected TASC Madagascar as one if its school charities for 2018-2021. Trustees Dr Chris Swinburn and Dr Jim O’Brien visited the school and spoke to some of the pupils in December and we look forward to working closely with the school over the next three years. 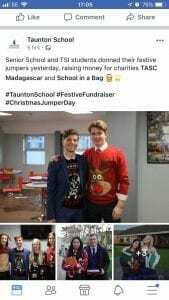 Festive pupils and staff raised money for TASC Madagascar on Christmas Jumper day! Thank you again for your support. We understand there will be fundraising fun during Rag Week and look forward to hearing more about the events involved. 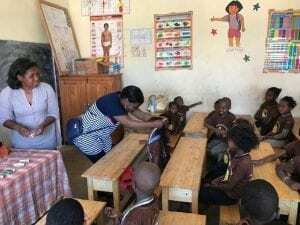 Funds raised by the school are being used to provide much needed school desks for children in Fianarantsoa. 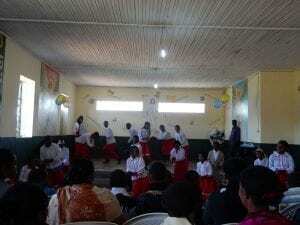 We have already funded the provision of some desks in Fianarantsoa and the picture above shows the children performing a thank you dance, wearing their medals for good attendance. 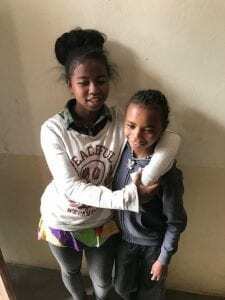 Valerie and her sister Philippine (right) were both living on the streets in Fianarantsoa. Two years ago TASC, working with Feedback Madagascar, found Valerie and managed to house her in a nearby convent. In September 2018, we discovered Philippine was Valerie’s sister. Philippine is now also living at the convent. Valerie wants to go on to university to train to be a doctor – TASC are seeking the 500 euros a year to help Valerie achieve her dream. We met with Clément and his daughter Sophie, unfortunately Clément is seriously ill so his future is uncertain. Whilst there we handed out food, drink and new clothes. Clément gave all his food to Sophie. 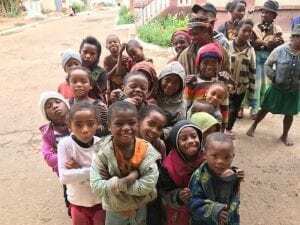 The picture (left) shows just some of the 55 street children TASC are sending to school in Fianarantsoa. TASC has been involved in a significant amount of work at St Joseph’s School for the disabled. After funding and building a new hall and providing a wheelchair accessible home for our special friend Noro and her grandmother right next door to the school, we are working with Ny Tanintsika, another of our partner organisations testing ground conditions at St Joseph’s school for providing clean water at the school. 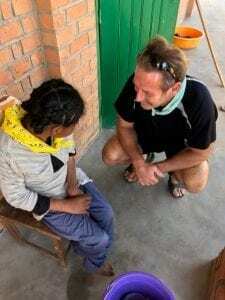 TASC Trustee Pat O’Brien managed to spend some time with Noro during his visit in October to monitor the various projects with which TASC is currently involved . It was heartwarming to see how happy and healthy Noro is today compared with when we first met her. Thank you all for your support which let us help change the life of this bright young lady. 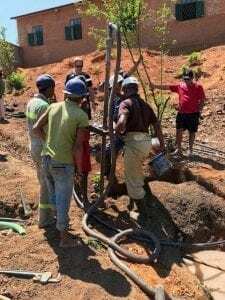 TASC is once again working with its partner organisation The Adsum Foundation to build their third new primary school in Madagascar. 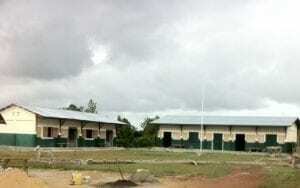 This latest school is at a small village called Andasy near Vohipeno. When the school is finished TASC, through negotiations with the education authority, has ensured all the teachers will get training and their wages paid regularly. It is hoped this will then have a knock-on effect with the children’s exam results, improving on the current 30% achievement rate. As you can see, it is a vast improveement on the former wooden huts shown below. 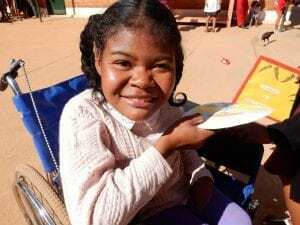 Readers will remember Noro, a young disabled girl who TASC have been helping for some time. When we met her she was living in poverty, not going to school, very sad and had no hope. 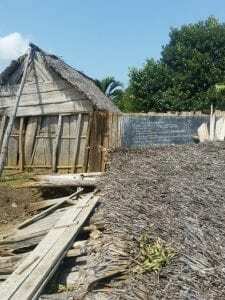 Working with local agencies, TASC has used part of a generous legacy from Dr William Hutton to build a new hall for the school for the disabled at Andaobato, and to build a house next door for Noro and her grandmother who cares for her. The house is adapted for Noro’s needs and has a wheelchair accessible WC. Noro is now attending the school and is visibily improving. She has daily contact with other young people and is becoming more confident and much happier. She is now talking a little and has a reason to live. 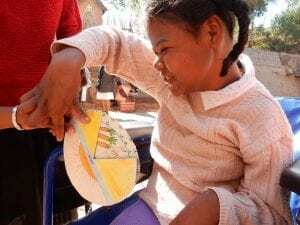 TASC Madagascar is also supporting Noro’s grandmother back into work so she can provide an income for herself and Noro. We are delighted that Noro is one of our amazing “starfish”. The Hall is used not only for education but for local exhibitions, assemblies, parents’ meetings and other festivities. It is a wonderful addition to a inspirational place which provides help and support for disabled children in the area who otherwise would have difficulty even surviving. The new Hall opened amid happy celebrations in June. Pupils including Noro enjoyed dancing, prayer and fun at the opening celebrations which lasted all weekend. TASC is delighted to have been able to help with this project. Here are the exciting new plans for our third school project. Click on the link to see how it will all look once finished. If you would like to contribute to this great project, please get in touch! 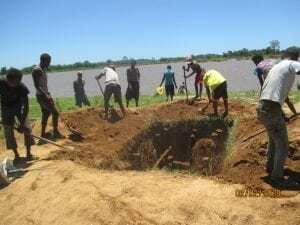 Following the successful installation of the first treadle pump on the Matitatana River, the community of Sarinesy has joined with TASC Madagascar to install a second pump to irrigate land close to their village. These treadle pumps are substantial, erected on a concrete platform to raise them above the river water during the monsoon season, and built to last. They will irrigate a substantial area and should help local communities provide food and employment. We will add more pictures as the work progresses. Did you notic e the story about Patricia in the last newsletter? Patricia was 16, malnourished, pregnant and suffering from magnesium deficiency when we found her in the homeless community in Fianaranatsoa during a recent visit. We have supported her by moving her into a halfway house and providing medical care and support. She has now had the baby and mother and daughter are both doing well. We will continue to support her and her family and help them into more permanent accommodation with a means to earn a living. We will keep you updated!